The building that is now the Plymouth Town Hall has been a part of local and county government since its construction in 1891. The Courthouse, now known as the Plymouth Town Hall, was owned by Grafton County until 1972 when it was sold to the Town of Plymouth. Originally designed to stand for centuries, the Plymouth Town Hall is a monument to the community's strength and permanence, and a symbol of its identity. The building was entered in the National Register of Historic Places in 1982. The Courthouse Bell was introduced in 1849 to open court with its summons. The Bell's trademark reads "Henry N. Hooper & Co. Boston, 1849, No. 317". This company purchased the foundry of Joseph Revere, son of Paul Revere. In 2005 the bell tower was damaged when struck by lightning. 3G Construction repaired the damge to the slate roof, brick cornice and wall on 90’ bell tower. The New Hampshire State House, with its guilded dome, is the focal point of downtown Concord. The State House was ready for occupancy in 1819, eleven years after Concord had been officially designated the state capital. Designed by architect Stuart Park, after whom Park Street is named, the building was initially only two stories high. It was built of local granite, quarried by prisoners housed at the nearby New Hampshire State Prison. In 1866 the State House was remodeled with a mansard roof, enlarged dome, and granite portico, all financed by the City of Concord. In 1910 the third story and west wing were added. The present New Hampshire State House is the only state capitol whose legislature still sits in its original chambers. In 2002 3G Construction restored the entire dome, restored and replicated millwork, including window glazing, painting, gold leaf gilding, moisture protection, lead coated copper roofing and flashings. St. Mark's Episcopal Church built in 1899 is an historic Episcopal church located in Ashland, New Hampshire. On December 13, 1984, it was added to the National Register of Historic Places. 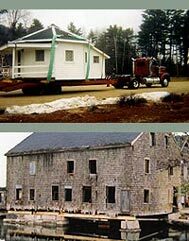 In July 1998 3G Construction removed the existing bell tower and built a new 90’ timber frame and masonry tower.